The 2014-2015 Auroris Dance Company presents “Impulse” on January 15 through 18 in the Niles North Auditorium at 9800 Lawler, Skokie. Performances will be on Friday, January 16 at 7 p.m. and Sunday, January 18 at 5 p.m. Tickets may be purchased at the door for $10. 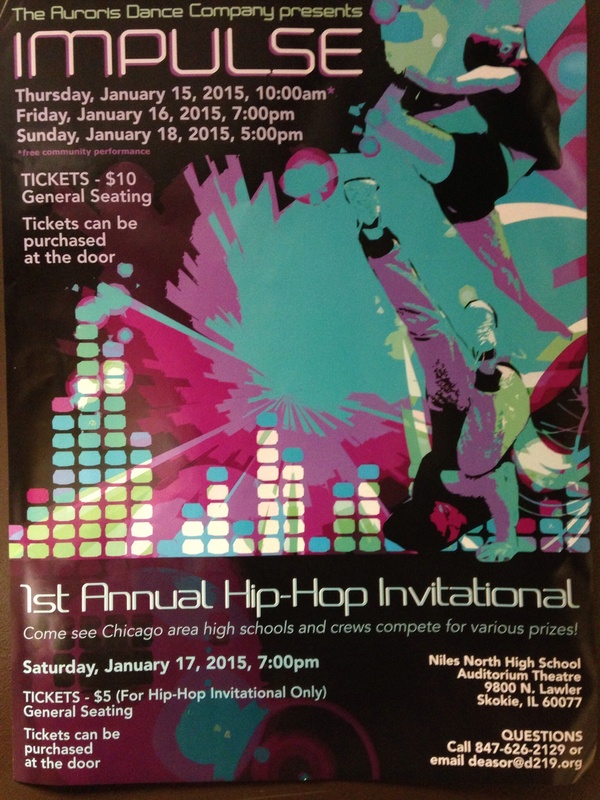 Tickets can also be reserved in advanced by contacting Deanna Sortino at deasor@d219.org or 847-626-2129. The dancers will be performing all different styles of dance including jazz, modern, hip-hop, Broadway, Bollywood, Argentinian folklore and ballet. Guest choreographers include Soledad Centurion, Corey Nagel, Santo Scavuzzo III, Elmo Scott, Martin Ortiz Tapia, and Lauryn Schmelzer (NN Alum). The company consists of 31 dancers under the guidance of Artistic Director, Deanna Sortino and Assistant Director, Danielle Wilder. Captains are seniors Sivan Eliasoff, Christan Cole Fajardo, Keenna Shah, and junior Anna Hershinow. Seniors are Irene Diblich, Saadat Kaplinsky, Philip Khuu, Anna Mancia, and Allen Nou. Juniors are Jessica Badofsky, Alexis Benitez, Nati Duarte, Mi Lee, Olivia Meyers, Kagen Quiballo, Noam Ron, Mindy Smith, Joanna Tan, Jazmyn Trinos, Jisha Varughese and Abigail Villanueva. Sophomores are Cindy Liang, Juliana Tichota, and Gabby Ubaldo. Freshmen are Marcus Ambubuyog, Chloe Ballais, Mollie Chez, Tera Eliasoff, Emma Groner, Sharon Joseph, Julia Schneider, and Yetunde Washington.